The basic idea is that when typing, the hands should be in a neutral position. The neutral position for the hand is as if shaking hands. Typing with your wrists in any position other than the neutral position puts strain on the tendons and muscles of your hands, and increases your risk of RSI, or makes existing RSI worse. DorsiflexionMany standard keyboards do not allow you to type with your hands in a neutral position and directly cause the issues that lead to RSI. There is a solution however! Ergonomic keyboards make it easier to type with your hands in the optimal position. 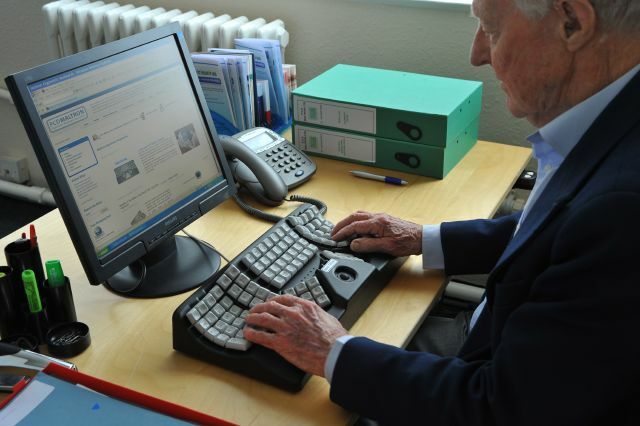 As well as splitting the keyboard in the middle to reduce ulnar and radial deviation, they allow for the front of the keyboard to be raised to avoid dorsiflexion. The design of this ergonomic keyboard fits the shape of hands and the different lengths of fingers to reduce movement and tension. Straight vertical key columns eliminate tens of thousands of finger and wrist twists in a day’s work. Redefined thumb groups with double height key for spaces (left space is the E with the Maltron Letter layout) now also have double height keys for return and tab. The letter keys are angled inwards to match natural finger movements and the keys for the longer fingers are recessed further to reduce finger “cramping” and provide a more relaxed hand posture. The Maltron ergonomic keyboard is available in a variety of languages and layouts, including QWERTY, Dvorak & Maltron. Don’t let your keyboard be the cause of pain and potential loss of capacity. For more information about this innovative keyboard, and to order one, please contact us today.